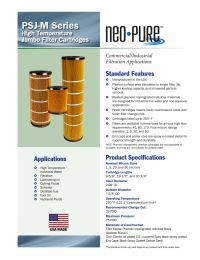 The Neo-Pure PSJ-170-05M Pleated High Temperature Jumbo Cartridge is manufactured in the USA and designed to be used in applications where temperatures may range up to 250°F. Neo-Pure High Temperature Cartridges are constructed out of pleated phenolic impregnated cellulose media and come with Buna-N gaskets. The pleated surface area increases filter life, loading capacity, and particle removal. Filter Dimensions: 30-3/4" x 7-5/8"
NOTE: Compatible with the American Filtration 831-5B and Watts FMPIC-170-5-HT.